Myanmar is considered as a “sleeping beauty” because the country has closed its door for a long time. However, its authentic charm and rich culture make tourists thrilled. A Myanmar trip is an exceptional opportunity to discover Burmese customs and traditions that are both strange and fascinating. In Myanmar, people do not have a surname. Indeed, children will bear the name of the date of birth that has a special meaning in Chinese astrology. Every day of the week corresponds to the name of a mascot. There are also absurd names that are often given to newborns to scare the cradle spirits, therefore, children can then get rid of them. According to statistics, the Burmese generally do not use more than 100 letters for names. These letters are combined together to invent names that are easy to call, so there are many people in Myanmar who have the same name. To help identify them, occupations and positions are added usually before or after their name. This is an interesting feature of Burmese culture. If you make a trip to Myanmar, you will find the Burmese weddings are quite complicated. The two families of the couple must choose a government officer or businessman (successfully, happy, have sons and daughters) to wrap a wreath of flowers around the groom's and bride's neck during the wedding to bring luck to the couple. He will give them wedding rings wishing them a faithful eternal life. Then the president of the ceremony will present biographies of the bride and groom to the guests. Depending on their financial condition, the couple will choose a salty or sweet wedding party, but there will necessarily be traditional music. Most guests will offer gifts to the couple, but others will give the money. Wedding gifts will be displayed in a central location to show the elegance of the wedding. If guests give money, the amount of money should be the multiple of 100. In Burma, monogamous marriage applies strictly. Yet the state does not limit the number of children per family. The marriage rate in Myanmar is the lowest among countries in the Southeast Asia region. Women in Myanmar have the same rights as men in society (except for religious sector) and are often "prioritized" in the property when the couple divorces. The preparations and organizations for funerals in Burma are simple. The hosts invite monks to sing so that the defunct soul can be free from suffering and then incineration takes place. Guests arriving at the funeral do not contribute money but deposit ceremonial objects (clothes, utensils for monks). According to Burmese custom, people do not usually bury the dead but incinerate them, so in Myanmar, there are almost no Christian cemeteries. In the family in Myanmar, there are only Buddhist altars and no altars for the ancestors of the family. Before 1948, as in England, the traffic on the left applied in Burma. After Independence, Myanmar enforced the international traffic law - roll to the right of the road. However, the Government of Myanmar allows traffic to both left and right. If you encounter this on the street during your trip to Myanmar, do not be surprised. The people of Myanmar strictly abide by traffic laws even without the police. Road police officers appear only when the traffic lights are malfunctioning or in the event of a traffic accident. Buddhism has a great influence on the daily life of Burmese people. People live honestly and preserve national traditions, including strong family ties. They respect elders, practice Buddhist worship and wear simple and casual outfits. Solidarity in the community is very high in Myanmar, whether in urban or rural areas, people treat each other politely. There are rarely quarrels and fights in public. Families or groups of people living along the roads in cities and rural areas often have the responsibility of placing a pitcher at roadsides so that visitors can drink free. They regard this action as a form of almsgiving. This is another beautiful facade of Burmese culture that bears witness to the exceptional generosity of the people in the land of golden temples. Respecting the law conscientiously is also another beauty in the social life of Myanmar. The hunting of animals and the arbitrary cutting of green trees are taboos for the people in Burma. These good manners are also influenced by the culture of Buddhism practiced by most of the population of this country. Offenders are heavily sentenced and punished severely by the authorities. "If it is not our property, then it should not be used" is thus another good practice well applied in the daily life of the people of Myanmar, strongly influenced by the Buddhist spirit. It can be said that Burmese culture is immersed in that of Buddhism. Crimes or thefts in public places are very numerous and of course, the community and the law will strictly punish. With this way of life, the phenomenon of adultery rarely occurs. The people of Myanmar are afraid and ashamed of the "crime" of adultery or of illegitimate children because they will be severely condemned and isolated. Voluntarily offering food to monks seeking alms is also a traditional Burmese culture. Many Burmese, though poor, are always ready to give food, money for monks and nuns. They feel very happy with this practice of charity. During a trip to Myanmar, foreign tourists will be surprised to see every morning a group of young monks holding a bowl and looking for alms on the streets of the villages. Many benefactors wait in front of the portal of their house with a little rice and food, piously serving those to each monk. When monks, nuns pass through the city center, sellers give offerings to one or more monks and nuns, depending on their abilities. Despite the still-modest material life, many people from Myanmar in urban areas to rural areas always carry goodwill with animals. They share a small part of the family's food with birds, squirrels, dogs, cats, etc. If you make a trip to Myanmar and take a walk in the markets, you will see stalls selling wreaths, reserved for food buyers for birds. Tourists are surprised to see many types of birds, squirrels and dogs playing freely in the streets of Yangon in Myanmar. These animals are audacious and familiar to men. Myanmar's "superior man" design is quite cumbersome. Some sacred temples prohibit women from approaching Buddha statues or coming to places "reserved for men". They can not put gold on sacred objects in temples. Even worse, they do not allow themselves to put their head on the arm of their husband because this will make lose the strength of this man and his mind is therefore blanker. 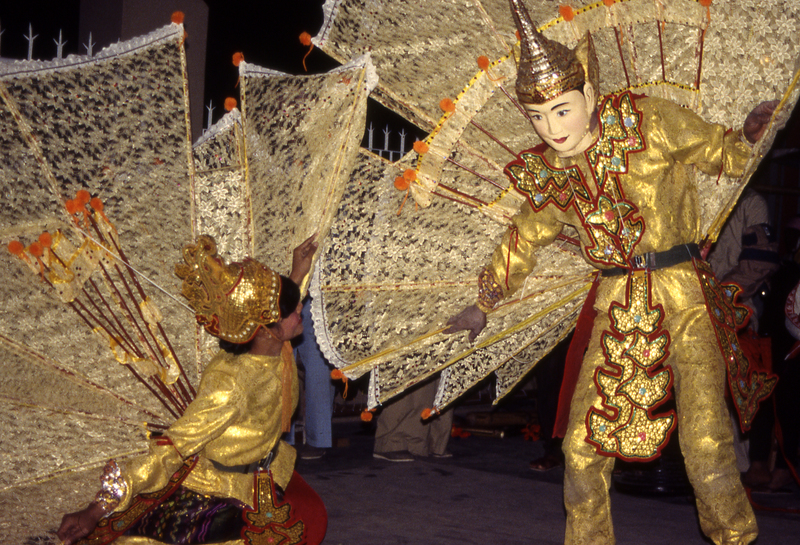 This strange custom always remains a controversial subject of Burmese culture. The people of Myanmar regard the head as the highest place to show respect. Therefore, other people should not touch their head. If you are in your Myanmar travel, you should pay attention to this practice. Even if you see an adorable child, do not touch his head. Someone should avoid putting their hands on their colleagues’ shoulders because this is considered an insulting gesture. When Burmese donate or gift to the elderly, they use only the right hand because the left hand is used only for the toilet. According to the Burmese custom, going east will bring happiness. It is said that the East is the place where Buddha sought purity. This is why Buddhist statues in Myanmar families are usually placed near the eastern wall of the main room. So, during sleep, heads must absolutely be turned east, not to the west, because it is an insult to the Buddha and will therefore bring misfortune. The people of Myanmar also believe that the west is the deadly place. In the past, a King of Myanmar ordered to decapitate many prisoners in a western port. So someone can not sleep with his head turned west. It is also said in Burmese culture that the east and south are important directions, while the western and northern directions are less appreciated. With this in mind, during family meetings or reunions in Myanmar, the chairs of family heads are often located to the east or south. According to ancient Burmese customs, during the three-month period from 15 April to 15 July each year, monks do meditation. So, all kinds of big events like marriage can not be held in this period. In September, October and December there is no wedding ceremony. It is said that a marriage in September does not end in love. In October the couple will have financial difficulties and a marriage in December will end in a conjugal separation. Today, these customs have disappeared over time, especially in large cities. For many reasons, about 30% of women in major cities in Myanmar do not build families. In the workplace, this rate can reach up to 50%. Thus, during your trip to Myanmar, do not ask women questions about the family, husband and children. In addition, Burmese customs do not accept gestures of affection in public. Raising the chin and signaling by the foot are considered very impolite in Myanmar. Killing animals is also an unacceptable act in Burma. This is still strictly adhered to by Buddhist followers. The people of Myanmar do not buy poultry, shrimp, fish that are still alive at the market. They buy only ready-made meals. Many Burmese people do not eat beef because they consider the oxen as companions. Eating dog meat is taboo and a horror gesture in Burmese culture. Origin of the name "Myanmar"
The name "Myanmar" was used at the beginning of the twelfth century. Despite its still uncertain origin, Myanmar historians believe that this name comes from "Brahmadesh" in English. In Sanskrit, it means "land of Brahma" - the Hindu god of all things. On May 5, 1989, the Burmese Order Restoration Council and institutions changed its English name and renamed "Myanmar", at the same time as making changes in the English name of other parts of the country. The name of the former capital was changed from "Rangoon" to "Yangon". In Burma, "Myanmar" is the name of the country, while "Bama" (taken from Burma) is the familiar name. However, many groups of Burmese exiles continue to use the name "Burma" because they do not accept the legitimacy of the current military government of Myanmar as well as the change of name of the country. Some Western governments, including the United States, Australia, Ireland and the United Kingdom continue to use the name "Burma". The European Union uses the two names "Myanmar" and "Burma" while the United Nations uses the name "Myanmar". The use of the name "Burma" is still very popular in the United States and Great Britain. In English, people still use the word "Burmese" as an adjective. A trip to Myanmar promises an exceptional discovery of the land of golden temples. Not to mention the beautiful landscapes that bring authentic charm to people in the sacred lands of Buddhism, Myanmar fascinates us with its rich culture as well as its unique and strange customs. A beautiful country to absolutely explore!